Ancient Egyptians believed in afterlife and that a person consisted of the body and of the soul - akh (sometimes referred as ka). The belief based on conviction that the akh will return to the body after death which explains the ancient Egyptian burial practices which are notable for embalming and mummification of the bodies of the deceased. Embalming and mummification were initially reserved only for pharaohs but eventually they became accessible to all social groups. The process of mummification in ancient Egypt was very complexed and greatly depended from the social status of the deceased person. The higher the social rank the better the mummification. The process of mummification started with removal of internal organs through a slit cut in the abdomen, while the brains were removed through the nose. 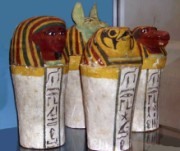 All removed organs except for heart which was left in the body were mummified separately and placed into so-called canopic jars. The body was then filled with resin and various herbs and placed in a mixture of salts called natron (soda solution) for about 40 days to dry the body. The mummy was wrapped into linen strips and placed into a wooden coffin or stone sarcophagus in which it was buried. Priests conducted religious ceremonies and rituals were conducted during the process of mummification as well as during burial process to properly prepare the deceased for the afterlife. Ancient Egyptians believed that the deceased has to pass certain tests which were performed by the gods among which was the most important the weighing of the heart against the feather of truth before achieving the afterlife existence. According to the ancient Egyptian conviction the most important part of the soul was the heart - Ib which contained records of deeds from lifetime of the deceased. 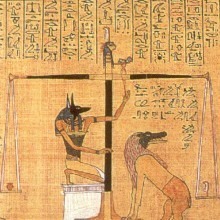 The heart after death was weighed by god of the dead Anubis. 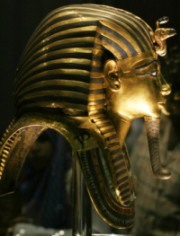 If the heart did not weight more than the feather of truth the deceased was allowed to the underground kingdom of Osiris but if the heart was heavier that the feather it was immediately eaten by the Ammit, the fearsome eater of the hearts. Ancient Egyptians added various magic amulets and the Book of the Dead which contained a collection of spells and instructions for the deceased to help the deceased to pass the weighing of the heart ceremony and other perils on the journey in the afterlife. Ancient Egyptians also believed that the deceased need variety of daily objects including food to be able to “live” in the afterlife. The type and amount of burial goods greatly varied from the social rank of the deceased as well as from period to period. Wealthy Egyptians were buried with greater amount objects of greater value such as splendid jewelry and even furniture, while the ushabti, small statues to perform labour for the deceased in the afterlife were added in later period. Like quality of embalmment and mummification, value and quantity of added burial goods which greatly varied from social rank and period, the burial sites greatly varied as well. Social elite and pharaohs during the Early Dynastic Period were buried in the mastabas, a flat-roofed rectangular buildings with burial chambers deep inside, while the periods of Old and Middle Kingdom were characterized by pyramid building which reached its height with the Giza Pyramid Complex. However, building of pyramids as tombs for pharaohs began to decline shortly after construction of the Great Pyramid of Giza and the pharaohs of the Middle Kingdom chosen the Valley of the Kings as their burial site. Most of entry doors of the tombs of pharaohs had written curses warning all against entering the tomb. 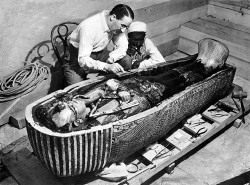 Despite that the vast majority of 62 tombs and chambers in the Valley of the Kings were robbed except for the tomb of Pharaoh Tutankhamun which was discovered intact by English archaeologist Howard Carter in 1922 and contained the greatest treasure ever discovered.